If you love banana bread even half as much as my family does, I promise that you will love these easy Banana Waffles. 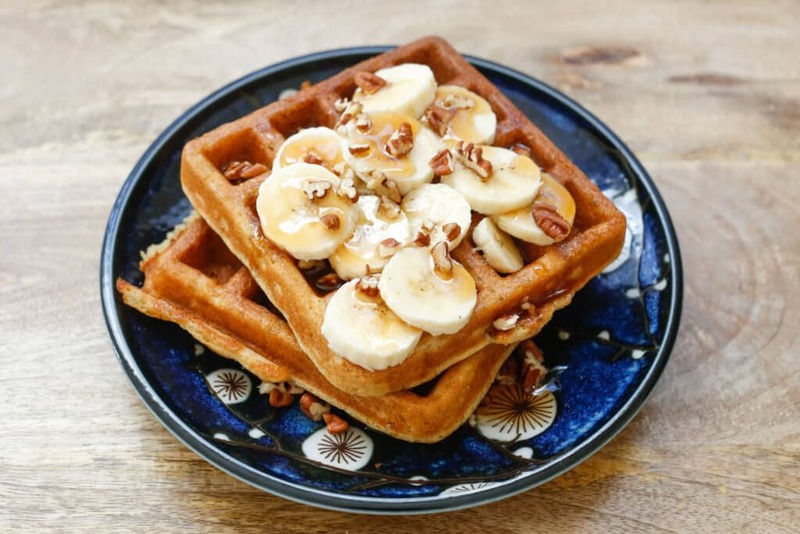 They meet the craving for banana bread with a light and fluffy waffle, perfect for any topping you choose. As with so many recipes, this one was inspired by the ingredients already in the kitchen. A bunch of very ripe bananas met my son’s request for waffles. I played with our favorite waffle recipe a bit and the result is a beautifully crisp waffle that is almost unbelievably light and fluffy inside. I am so giddy over these banana waffles that I made them twice this week, just to make sure they were as perfect as I remembered. And yes, they really are amazing. 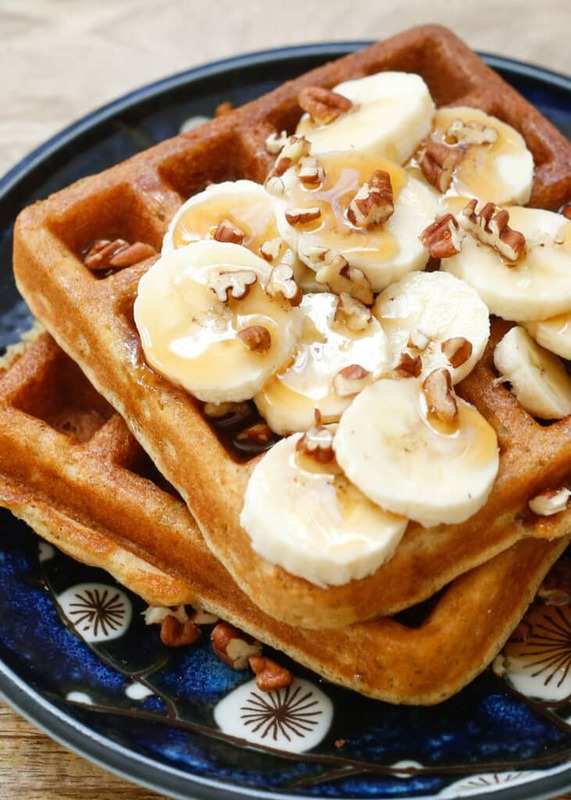 On their own, or topped however you like, these Banana Waffles are great any day of the week. Preheat your waffle iron. Whisk together the bananas, eggs, buttermilk, and vanilla until smooth. Add the dry ingredients to the wet and stir until smooth. Stir in the melted butter. 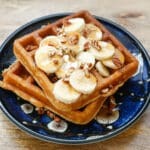 Pour batter onto the hot waffle iron and cook until crisp and browned. Serve with the toppings of your choice. Enjoy! FREEZER MEAL: Let the waffles cool completely, before storing them in an airtight Ziploc bag. Reheat the frozen waffles in a toaster oven or in the microwave. Hi Mary, one of my daughter's was recently diagnosed with asthma. After doing some research, I've decided to go gf. I intend to use many of your gf recipes. My question is, is there such a thing as a general all purpose gf baking flour? There are several all purpose GF flour blends that might work for you, I've heard great things about the Cup4Cup brand. For myself, I've found I get the best results with separate flours, simply because each recipe can need a slight tweaking. These look so yummy. I am going to try these soon. Do you think I could use coconut oil or palm shortening? I have a child that is allergic to dairy. Thanks for posting this! Yes, you should be able to use an alternate milk (I'd probably use almond) and a coconut oil or palm shortening. If you want a slight coconut flavor, coconut milk and oil would be delicious too! Happy Easter Mary! Hope you have a wonderful day with friends and family. Love these waffles! Love the idea of coconut oil - going to have to give it a try! Now that's a breakfast worth waking up for!! Love this recipe, but Why do my waffles look like a deflated balloon. Your recipe says 1/4 light brown sugar. 1/4 what of light brown sugar? Is it a 1/4 cup? Yes, it's a 1/4 cup of brown sugar. I've corrected the recipe now to reflect that. Thanks for the heads up!